Sitting on the beach all day. And, most importantly, feeling safe in the knowledge that Latitude’s programmatic display activity was in very capable hands in my absence. So much so that in fact, when we saw a hotel warning it had ‘poor Wi-Fi connectivity around the pool area’, we didn’t hesitate to book our stay. Before I go on, don’t worry. It kind of sounds like I’m about to tell you about a disastrous scenario that happened at work whilst I, Head of Programmatic, sunbathed obliviously, thousands of miles away. Anyway, the holiday was going great – until me and my girlfriend had an argument in the middle of a Greek supermarket. We’d ran out of sun cream and were faced with the dilemma of choosing between two different options. When you travel as a couple, these tend to be democratic decisions – i.e. in the event of any disagreement, some form of compromise would need to be met between the two parties. The first thing we came across was this fancy-looking oil product. It was SPF 30, had a four-star rating from the EU Sun Advisory Board, and had ‘Will Make You Tan’ printed across the bottle. It even had carrots in it. 14 euros, though. A rip off as far as I could see. That said, without getting too much into the detail, there was a difference of opinion. My girlfriend wanted the cheaper lotion, whilst I was flying the flag for Nivea. That’s when the “compromise” occured - and we ultimately ended up leaving the shop with the cheap stuff. So, you can imagine my mood when I actually ended up as red as a lobster by sunset that evening. I swear it was like cooking oil with chopped-up carrots in it. My feet caught it the worst too – really painful. Anyway, the next day I went back to the supermarket and parted with an additional 19 euros for the Nivea. I didn’t burn. More than I already had, anyway. Sometimes you have to pay more, but you get a better product. Just because something is cheaper doesn’t mean it’s better. That being said, the point I’m trying to make isn’t really about pricing. I knew what I was getting with the Nivea. And, when I go to pitch for new business, I like to think that my prospective clients know exactly what they’d be getting from us and, more importantly, our product. When I arrived at Latitude in late 2015, our display activity was outsourced and I was keen to get things in-house as quickly as I could. Previously I was working for a media buying agency, and I became renowned for having arguments with other programmatic suppliers – because of their lack of transparency. The reality is, a lot of people still don’t understand programmatic – and they are easy to take advantage of. I could say the same about the time I spent working on the publishing side of things at a national newspaper. It was incredibly frustrating having to deal with other media agencies, because they were being duped into buying a not-so-great great product. False promises make it easy to sell something, especially if the person you’re selling to doesn’t understand it. 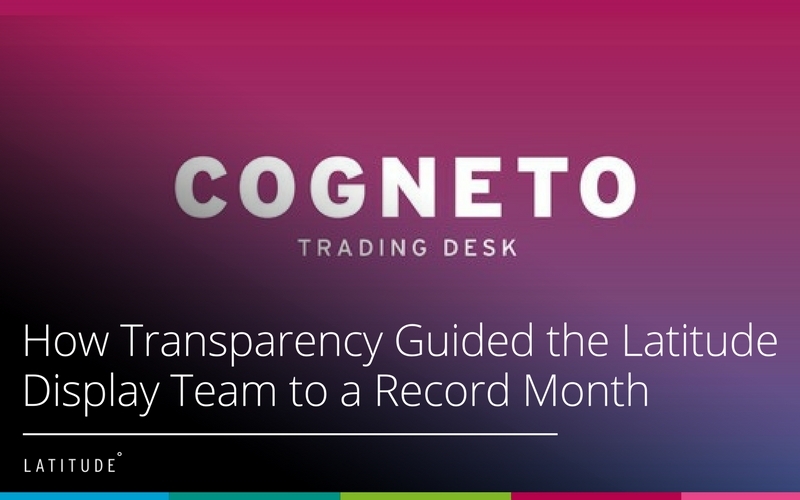 This essentially became my motivation for founding Latitude’s new product - under the name Cogneto - a trading desk built on transparency, media quality and data intelligence. Based on what I’d experienced before, I wanted our product to be something that followed best practice. Something that was underpinned by reasoned thinking and a data-led approach. Something more aligned towards the advertiser. Transparency would, therefore, be the key. This would enable us to be competitive with our management fees, and able to buy better quality media as a result. We began with one advertiser in February 2016. Because we were initially going for higher quality media, we had to pay more for it – i.e. we were opting for Nivea over carrot oil. So, our cost per impression increased from £1.50 to about £4. But, most impressively of all – our CPA went down from £155 to £75. So, by bringing our client’s CPA down by more than half – we had proven we had a good product. The point I’m trying to make is this - we’re proving it’s possible to be successful by putting the client first. So much so in fact, that I approach every action the same way. I ask myself – how would I run this activity if I was an in-house display strategist? What would I do if this was my money? Since the birth of Cogneto, we’ve proven that putting yourself in the mindset of the client delivers the best results. We pride ourselves on educating our clients – talking them through how they should attribute their programmatic activity, and advising them on the steps they need to take when things are not going so well. I have so much conviction in what we do because we have our clients trust. Looking to the Future – What's next for Cogneto? There are so many ads on the internet now that it can actually ruin people’s online experiences. One particular format I hate at the moment is in-read video. You know those videos that just start playing out of nowhere, disrupting you when you’re in the middle of reading an article? The fact of the matter is, people go on the internet with intent. You don’t want to see adverts that aren’t relevant to you. That’s why I think GDPR can be a force for good in some respects. Because with better-cleansed data, there’s a better likelihood of placing ads in front of people who actually benefit from seeing them. Using the example of my holiday in Kos – I’m more than happy for the likes of Thomson holidays to remarket to me (mostly because I like to see the way other people are marketing). They might show me deals to Kos again. Discounted offers to Rhodes, Cyprus, wherever. That is of interest to me. I want to get a good deal on my holidays. I want to know if there’s a sale on. If I get an advert that is spamming me after looking at something once, and then never looking at it again - that isn’t enhancing my experience. The challenge for us as a display team moving forward is ensuring that we can promote adverts that don’t ruin the online experience for people. Adverts that are non-invasive, relevant – and look nice. Get those things right, and you’ll end up making good advertising campaigns that people will interact with. I’m really excited about the future for us. There’s no reason why we can’t have continue to grow. I’d like to think that next year the team will be considerably larger in size. We’re finally catching up with the demand – giving us more time to make the right decisions and move forward in the right way, focusing our efforts on the right areas. What’s more, we just had our most profitable month. Maybe I should go on holiday more often! Thomas Ives is head of Latitude’s Display department and Callcredit’s Programmatic offering, Cogneto. He is experienced in buying and selling of inventory, having worked for both agencies and publishers.